Scrip is a term that means “substitute money”. 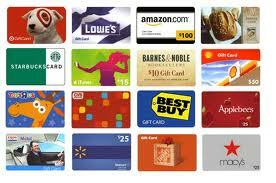 When you purchase scrip, you’re purchasing gift cards that are used just like cash. These cards are available from companies for everyday expenses like food, clothing, fuel, other essentials, dining, entertainment and more! 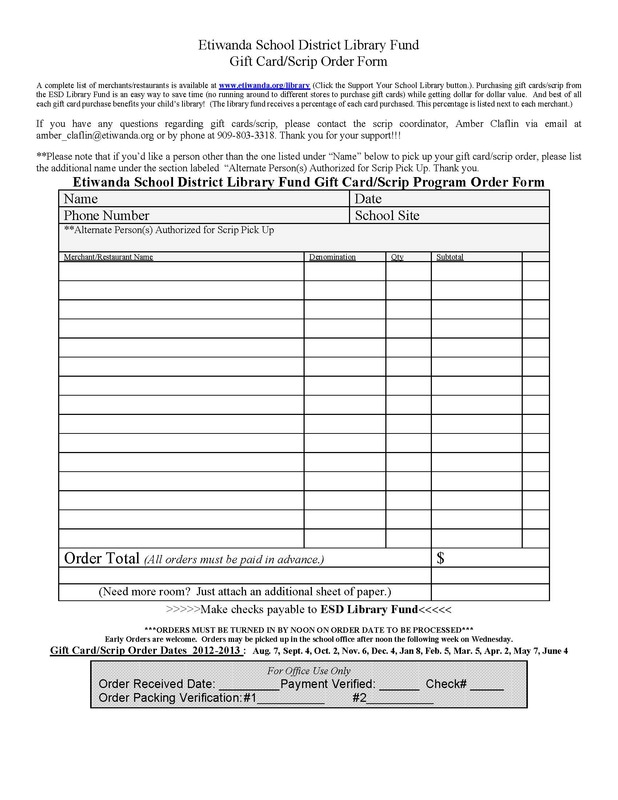 With every scrip purchase you make, your school library earns funds to use to purchase much need materials. 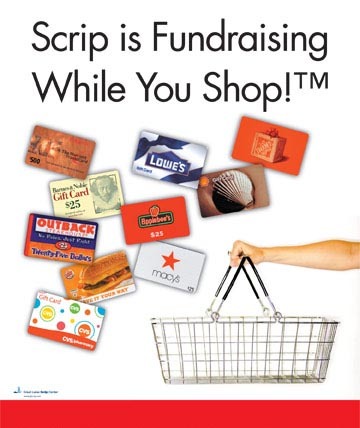 Which Retailers Participate in the Scrip Program? Many local, national and internet retailers participate. Download the full list of retailers by clicking the gift cards. 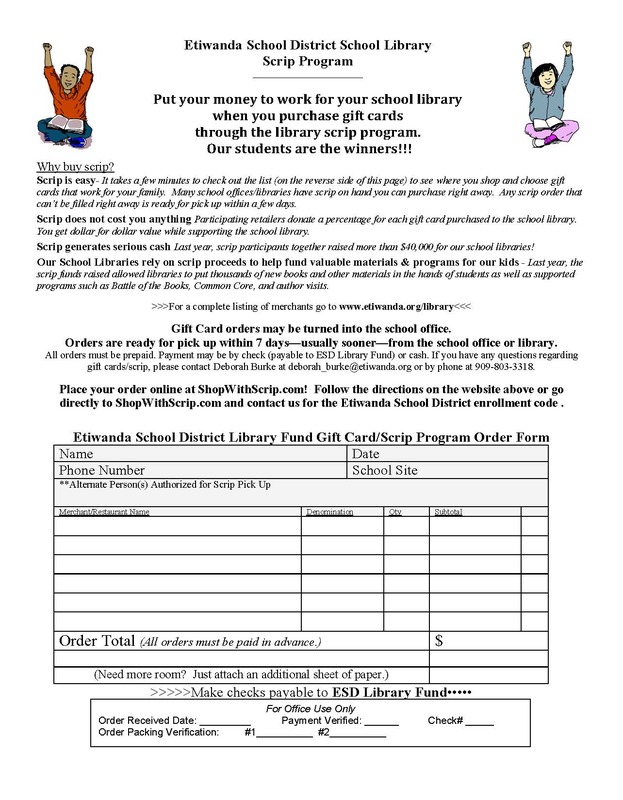 How does Scrip generate revenue for our school libraries? Every Scrip purchase from a participating retailer results in the school library of your choice receiving 2%-20% of the purchase price (percentage varies according to individual retailer agreement). For example, if you purchase a $100 Stater Bro's card to use for groceries, your school library will receive 5%, or $5 from that purchase. 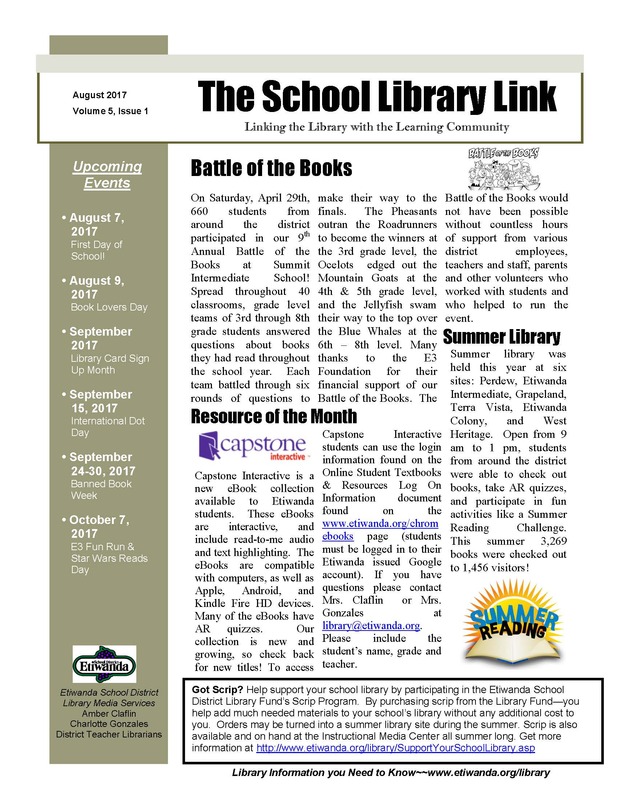 Scrip is “shopping cart fundraising” since it can generate revenue for your school library from your regular household purchases. So rather than paying retailers directly, buy scrip gift cards and then do your shopping. 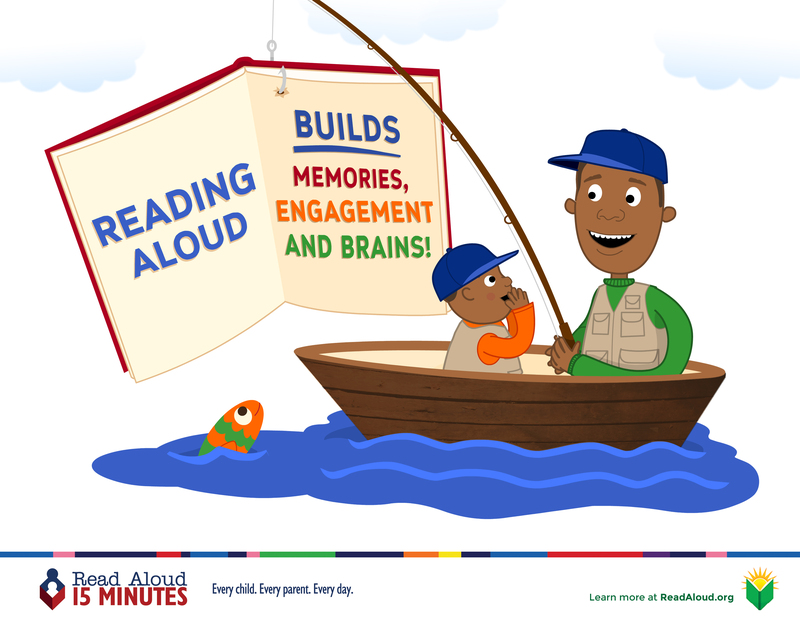 There’s no additional cost to you and it creates additional revenue for your school library! How do I purchase Scrip? There are a variety of ways you can purchase scrip. 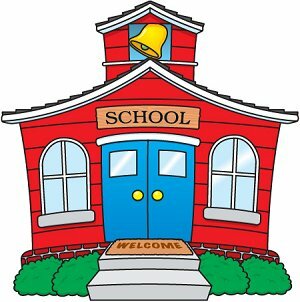 We welcome orders from school community members and their families, friends, and co-workers. 1. Order online through the ShopWithScrip link on this page. Please contact library@etiwanda.org for the enrollment code you'll need when you sign up the first time you place an order online. Once you submit your order, you can pay online using PrestoPay or you can turn in your payment (check or cash) to your school office along with a copy of your order. Scrip will be available for pick up within 7 days (though normally it is within 48 hours). Checks should be made out to ESD Library Fund. 2. Or fill out the scrip order form linked on this page. Turn in your completed order form along with your payment (check or cash) to your school office. Scrip will be available for pick up within 7 days (though normally it is within 48 hours). Checks should be made out to ESD Library Fund. 3. A growing number of our school offices have scrip on hand for immediate pick-up. Check with your school secretary or the District Scrip Coordinator, Amber Claflin (amber_claflin@etiwanda.org or 909-803-3318). 4. Order ScripNOW scrip through the ShopWithScrip link on this page. You can pay online or send payment as noted above to your school office. ScripNOW is available electronically and if paid for using PrestoPay can be received within minutes. Who do I contact if I have a question? If you have questions, please contact the District Scrip Coordinator, Amber Claflin (email: amber_claflin@etiwanda.org or PH: 909-803-3318). Everyday--Scrip Orders Turn Them Into Your School Office or Library TODAY!